As I was driving out to USANA Amphitheater for the first time this season, the sun was shining and it was a perfect 72 degrees. But on the horizon, in fact, headed right towards West Valley where USANA Amphitheater is located it was impossible to miss a very different picture. A dark cloud was rolling in fast! I knew this was a rain or shine show, but I’m sure like anyone heading to an outdoor concert, I preferred there be more shine than rain. When I arrived, it appeared that Cheap Trick was about to take the stage. The fog machines were on, and the crew was leaving the stage. But just then, I noticed the huge elevated speaker stacks lowering to the ground, and the crew rushed back to cover the soundboards and equipment as the wind picked up and the rain started to fall significantly. At that point, someone took to the microphone and announced that there would be a slight delay to allow the weather to improve. Ultimately this worked out in Cheap Trick’s favor because more people en route to the show would be there in time to see them. 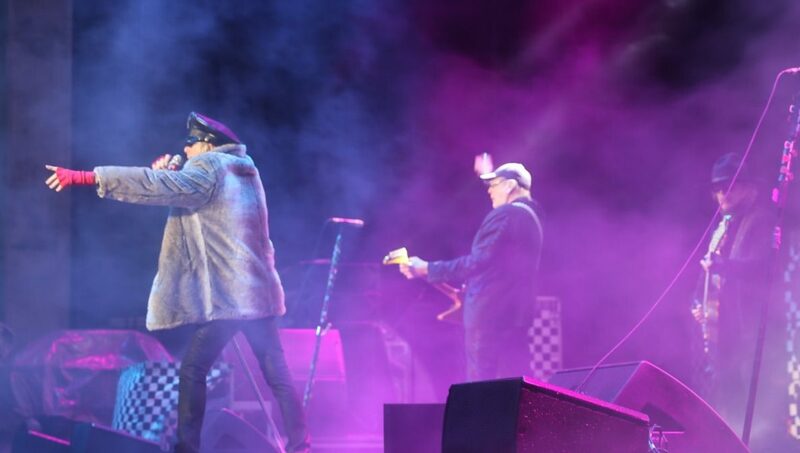 As the rain diminished, Cheap Trick frontman Robin Zander walked on stage in a fur coat and his signature shiny police captain’s hat. He stood there, looked out to the crowd without saying a word. His presence signified that the show was about to begin. Sure enough, the speakers were lifted, the plastic was removed and Rock and Roll Hall of Famers Cheap Trick took the state. It took a minute for things to settle in. The crowd was shuffling back to their seats, removing parkas, wiping the water off of their chairs, maybe a little distracted by the rain delay. But about halfway through the ten song set, It seemed like everyone locked in on the moment. The band was in good form, and the crowd was now focused on the legendary and extremely influential rock band. The crowd sang along to such hits as “The Flame”, and “I Want You to Want Me”. Now we were off and running. 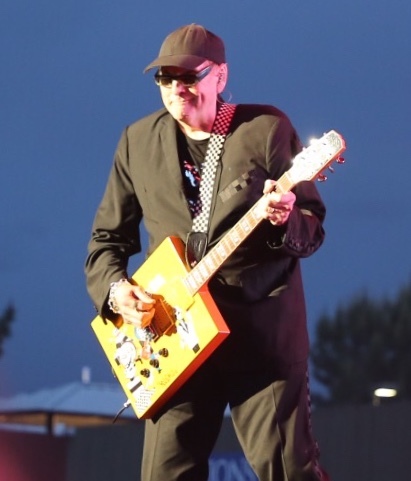 Guitarist Rick Nielsen cracked the audience up when he told us they were getting ready to release their “150th album” when in fact, it will be their 20th. He stated that if we hated the song it was only three minutes so it would be over soon. The song “Here Comes Summer” fit right in with the rest of the set. There seemed to be some confusion on if the band was going to cut their set short due to the delay, or play a couple more. I’m not sure if they cut some songs or not, but they played a few more songs and I’m glad they did. I would have been disappointed if I didn’t hear “Surrender”, which was one of the songs they finished with. Rick Nielsen threw out literally hundreds of guitar picks to the crowd. And what would be a Cheap Trick show without an appearance from Rick’s custom made five neck guitar? 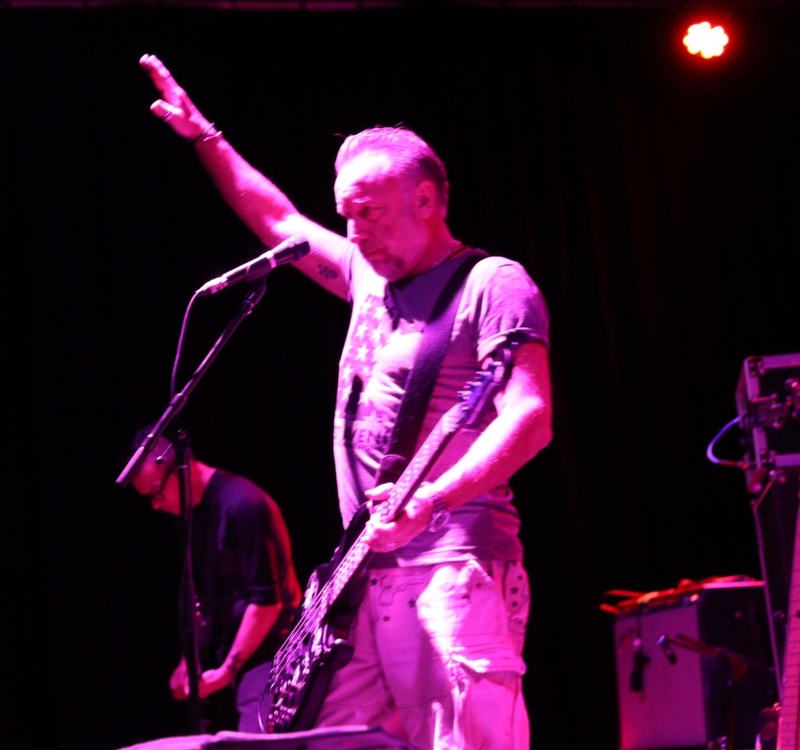 Rick left the stage and returned with it just in time to finish their set with “Auf Wiedersehen”. Cheap Trick handled the rain delay perfectly. It was a perfect warm up for what was in store for the rest of the night. Cheap Trick is an iconic band and I’m really glad I got to see them. 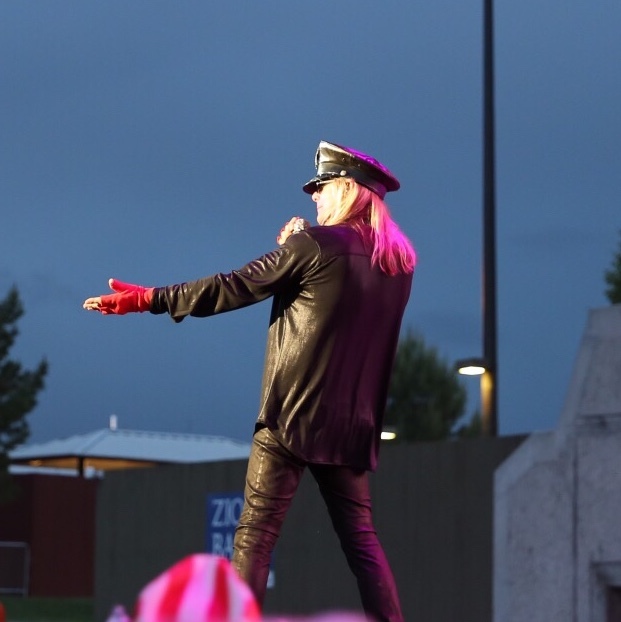 Due to the rain delay and USANA Amphitheater’s 11 o’clock curfew, the crew had to work fast to switch out Cheap Trick’s gear and move Poison’s in. I’ve got to say, they did an incredibly efficient job. Poison took the stage within ten to fifteen minutes of Cheap Trick leaving. Now to me, Poison is one of those bands that people absolutely love, or absolutely love to hate on. And I think Poison must know this. 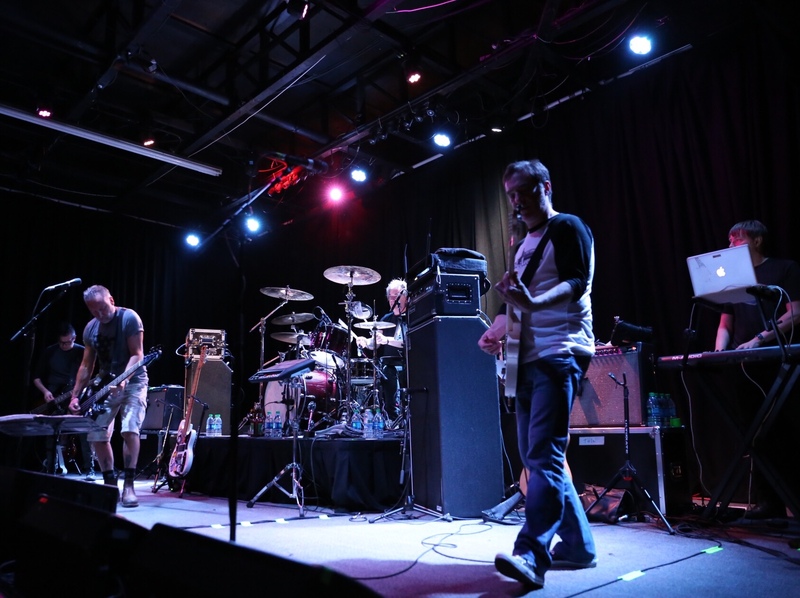 They work hard on that stage to give their devoted fans a night they’ll love, and put in an effort to win those over that might not be so sure about them. 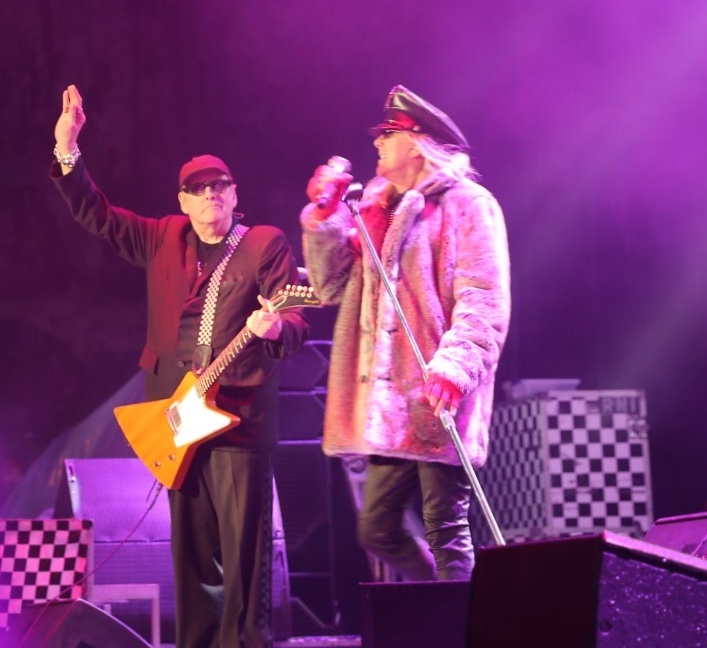 For the first three songs of Cheap Trick and Poison, I was at the front of the venue taking pictures. One of the security guards was telling me that he was looking forward to Cheap Trick, but wasn’t too interested in the Poison part of the night. I found it funny that by the third song in Poison’s set this same security guard was bobbing his head, and singing along to “Ride the Wind” with the rest of the crowd. This tour is called the “Nothing But a Good Time Tour 2018”, of course referencing their monster hit of the same name. 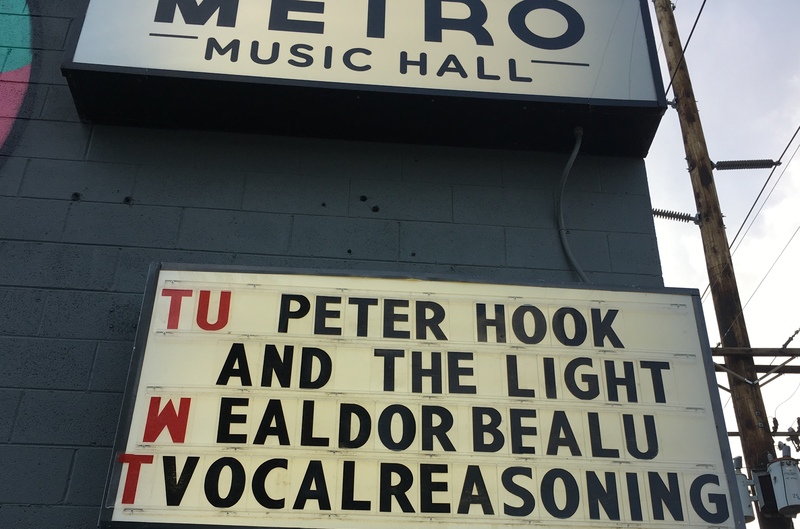 As corny as it is to use the name of a song, or the name of a tour to describe the night’s events, there is simply no other way to describe this show. It really was a good time. They took the stage and opened with “Look What the Cat Dragged In”. It was light speed ahead from there. I barely had time to recover or take a mental note for this review before they were ripping into the next song! 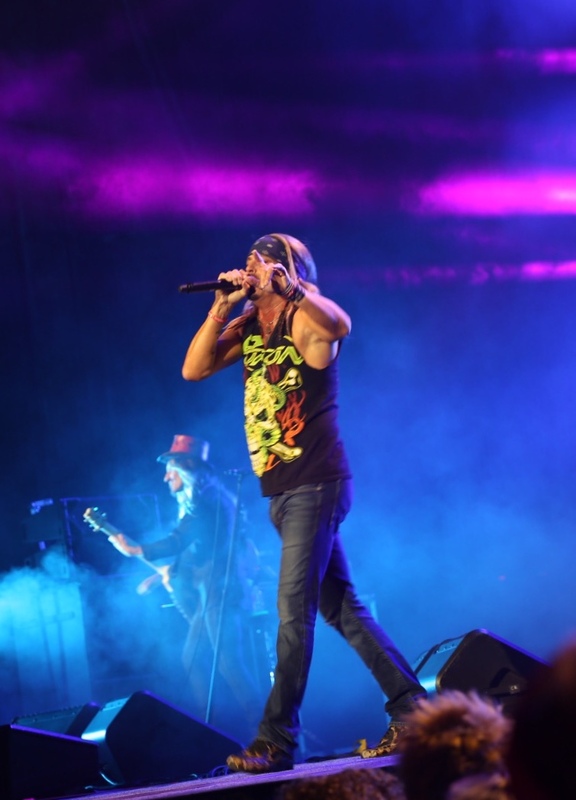 I have to give it to Bret Michaels, he’s an excellent front man. His energy knows no bounds. He was jumping, clapping, running, dancing, and still singing the whole night. He never seemed to be out of breath, or to even slightly slow down. I was so impressed. After several songs, throughout the night he’d say something like “Let’s just keep this going!”, or “We’re gonna keep this train rolling!” as they jumped into the next high energy song. 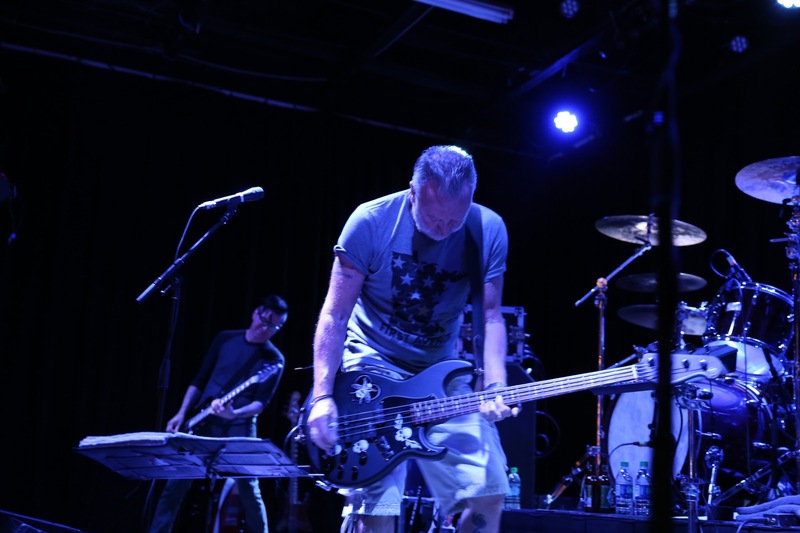 I had the opportunity to interview bassist Bobby Dall a few weeks back leading up to this show. I asked him if there was a song that he really looked forward to playing above others. He mentioned “Ride the Wind” was always a favorite, but then he stated that he never tired of playing any of their songs. I found that hard to believe since they’ve played these songs over and over thousands of times. But after watching him play in person, I have changed my mind. He looked like he was loving it up there. He seemed into every song and just totally fired up to be playing in front of this crowd. He was a pretty mellow guy during our interview, but he was far from that on the stage. I loved it. C.C. Deville, which by the way, is one of the greatest lead guitarist stage names in history, was also really fun to watch. There has been so much turmoil in this band over the years, but I was happy to see that it looked like he and the rest of the guys were in a great place and having (here I go again) a good time. I thought his guitar playing was as good as it’s ever been, and the crowd seemed to think so too. 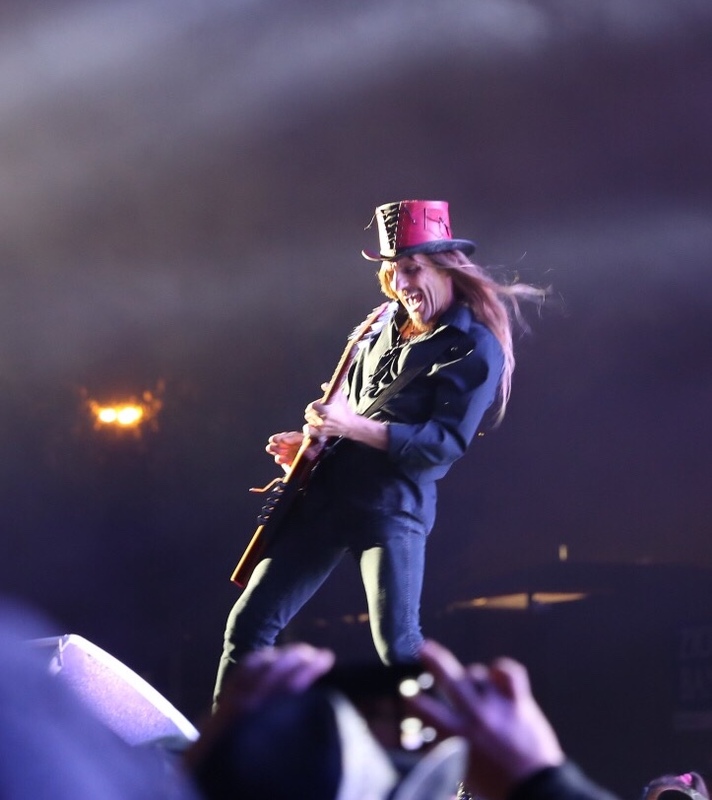 He received one of the loudest cheers of the night when he finished his guitar solo. Rikki Rockett (Another fantastic stage name!) is a really entertaining drummer to watch. Due to the nature of the instrument, most drummers are animated. But Rikki adds an extra flair and showmanship to his playing that fits this band perfectly. I enjoyed his drum solo which concluded with Bobby Dall returning to the stage to duet the “Pink Panther Theme” with Rikki. From my vantage point, I could see a little boy off stage with glowing noise cancelling headphones and drumsticks. I’m assuming this was Rikki’s child because he came on stage and played with Rikki during the encore. From what I can tell, the setlist was condensed by maybe one or to two songs. So really, not a big deal. However, they played their biggest hits. And I have to admit, I had forgotten just how many hits these boys had! They paid a special tribute to the military with a heartfelt rendition of “Something to Believe In”. They had the crowd at full voice singing along to “Talk Dirty to Me” and “Your Mamma Don’t Dance”. And of course, they brought down the house with their number one hit, “Every Rose Has its Thorn”. 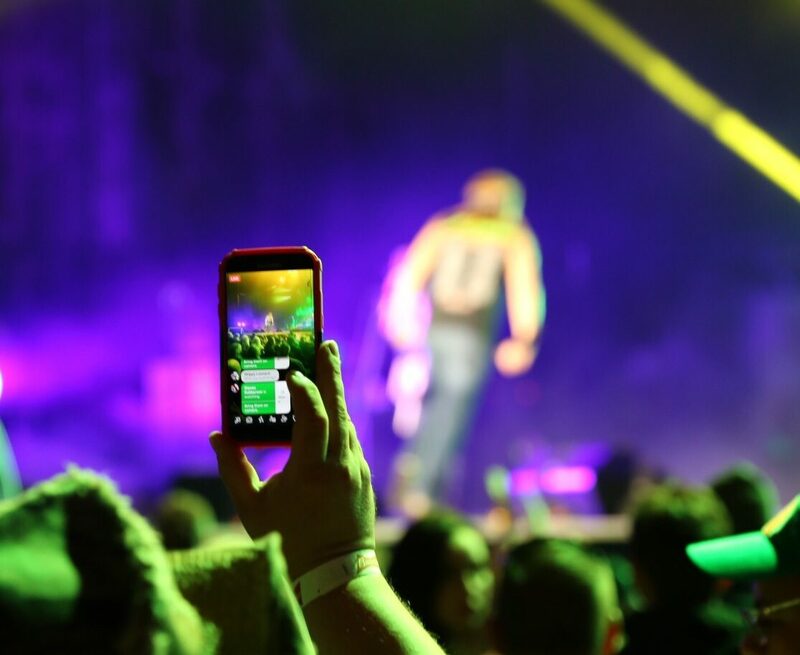 Couples were slow dancing, others were singing along, and of course, cell phone lights were beaming bright replacing the lighters that I’m sure Poison used to see fill their audience back in the day. 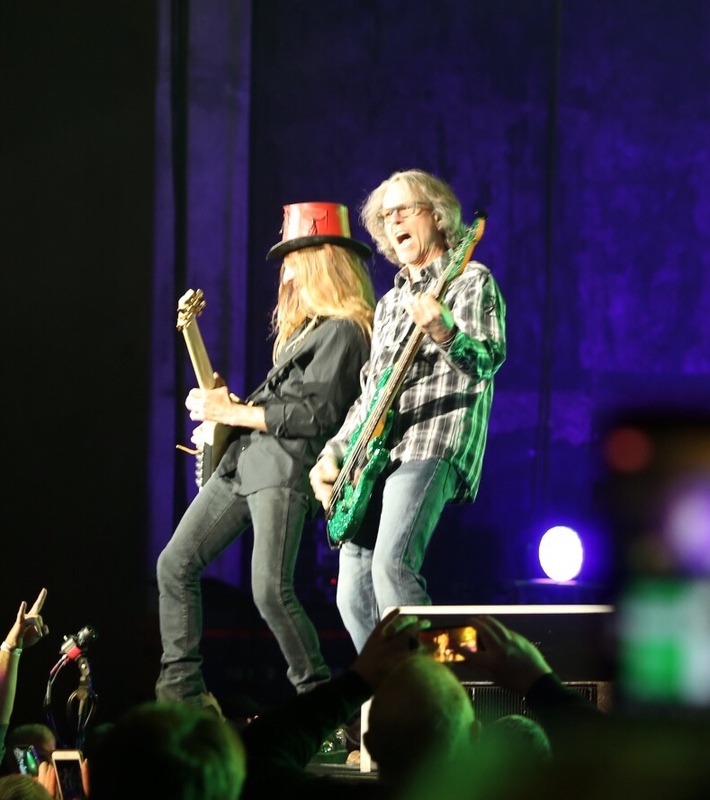 Poison finished their main set with the title of this tour, and I guess what could also be the title of this article “Nothin’ But a Good Time”. USANA Amphitheater was electric. The stage lights were amazing, the people were so happy, and I could tell the band was totally happy with the reception. 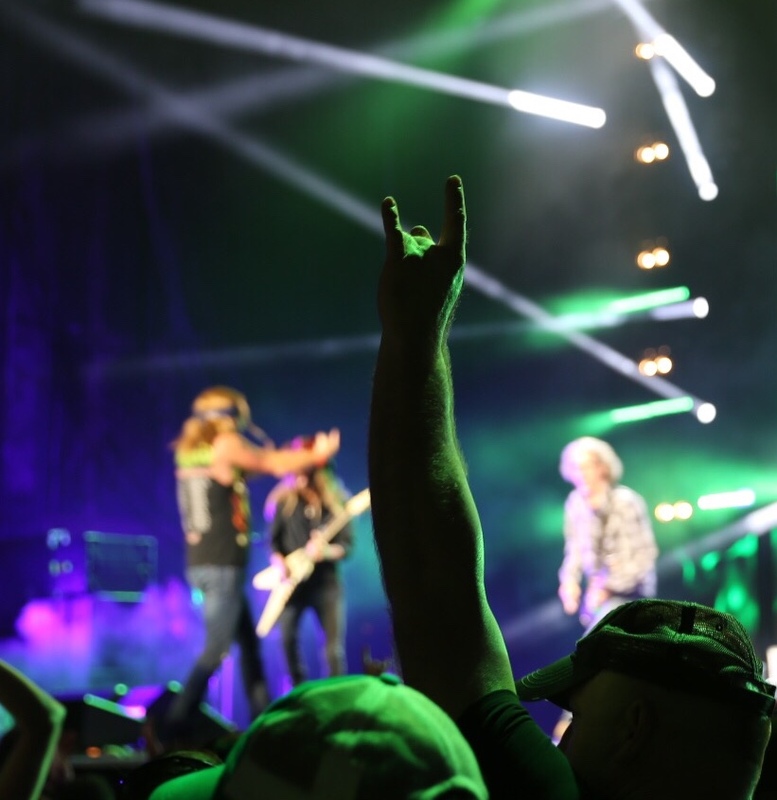 In the past several years Poison has been a part of these package tours where there will be three bands of a certain era or genre touring together. For example, I saw Poison open for headliner Def Leppard, with Lita Ford going before Poison. But on this tour, Poison is the headliner and closer of the show. I think it’s the right place for them. With these songs, this energy, and this fan base, I hope they headline their tours from here on out. The band came back for their encore and sang a cover of the great KISS anthem “Rock and Roll All Nite”. The place went wild, sang every word, and danced as if it was 1987. I brought my high school friend Jamin with me to this show. For the sake of context, Poison was at their height when we were in 5th and 6th grade. He mentioned before that he wasn’t really a Poison fan. Not a hater, just enjoyed a different type of music. He stated that the only song he really knew was “Every Rose Has its Thorn”. But as I was dropping him of for the night he said “You know, like this band or not, they’re really good, and they put on a great show. That frontman was so entertaining. They did a really good job. I really liked it.” That tells me that Poison did exactly what they set out to do here in Utah. Poison is a band that represent a specific era of music. Things back then seemed care free and all about looking for “Nothin’ But a Good Time”. With the way things seem today, it was nice to feel that care free for a couple hours. 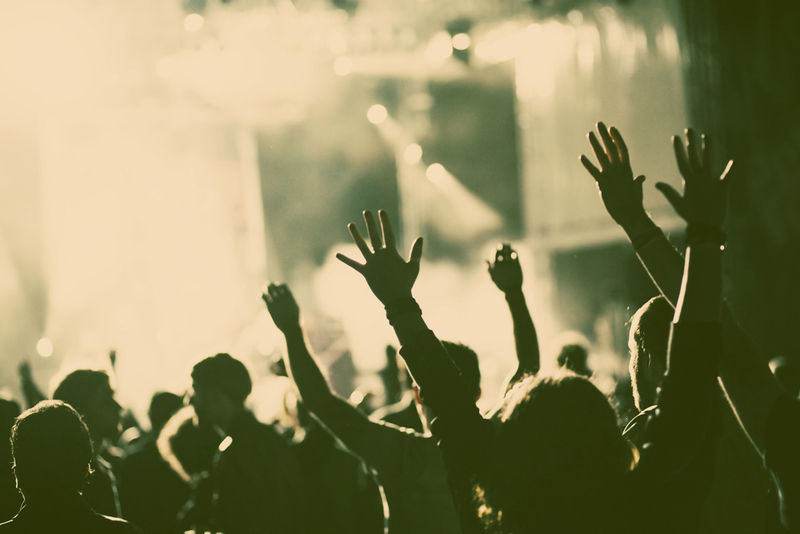 What is the responsibility of a support band? Open the show? Warm up the crowd? 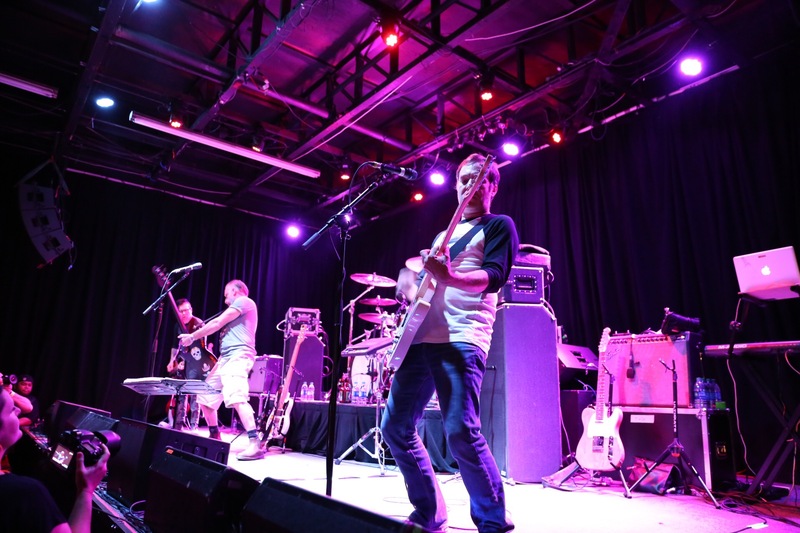 Gain exposure by performing a most established band? Win over some new fans? The answer to all of these questions is, Yes! I think JD & The Straight Shot were successful with all of these. My concern for openers is that no one will be at the venue yet when they go on, and if they are, no one will pay attention. I’m hopeful that the band is well received whether they are my type of music or not. In this case, I quite enjoyed what I had heard from JD & The Straight Shot so I had high hopes for them here in Salt Lake City. When they took the stage I looked around and the venue was already at about 60% full with more people filing into their seats. I’d say that’s a pretty solid turn out. The all acoustic band consisting of a couple guitarists, drums, stand up bass, fiddle, and “JD” Jim Dolan on lead vocals, broke into their set and I noticed heads actually turning toward the stage. Those same heads then began bobbing throughout the 45 minute set. I could tell that many members of the audience really liked the American Roots style music. I read the lips of someone saying to the person with them, “I really like this”, pointing to the band. I could see some clapping along and head bobbing particularly on “Run For Me” and “The Ballad of Jacob Marley”. I thought Jim Dolan was solid on lead vocals. I found him engaging when he shared stories behind the meaning of songs. He also reassured the crowd that if they hadn’t seen the current line up of The Eagles, that they were in for something special. I found it humorous that the style of music didn’t quite fit Jim’s speaking accent. From what I understand Jim is from New York City, and his speaking accent very much represents that region of the country. It surprised me at first because it’s undetectable when he’s singing. It didn’t ruin anything for me. Just a funny observation. I thought the band was fantastic. Each one of them coming into this band with an impressive professional resume’. Carolyn Dawn Johnson, guitarist, had amazing backing vocals and a really fun stage presence. The rhythm section was so good. Shawn Pelton on drums really kept the band really tight. Everyone was really in sync and connected and I felt like it had a lot to do with Pelton. I love the stand up bass. When I see a band walk on stage and watch a bassist pick up a stand up, I know I’m in for a good show. And of course, I wasn’t wrong. Byron House was really enjoyable to watch. His highlight was when he played the banjo for a song. It was obvious from the first cord just how talented Marc Copley is. He sang backing vocals and from my vantage point lead guitar. His vocals were excellent to the point that with no disrespect for JD, I was kinda hoping to get a song with him on lead vocals. He was that good. And finally, Erin Slaver, (who I had the opportunity to interview) on fiddle was the most fun to watch. You can’t have a great American Roots band without a good fiddler. And Erin was excellent on Fiddle. Her vocals were excellent as well. She dueted beautifully with JD a couple of times. Erin simply looked like she was having a really good time up there. She waved to audience members, and graciously bowed whenever they cheered. I could tell she enjoyed the performance. The vocals as a whole in this band were what impressed me most. I could see any of them singing lead in a band. That’s what made the sound of this band so good. They blended together really well with their harmonies. They were a pleasure to listen to. From what I could tell, the volume of the applause increasingly grew between each song. With about three songs to go, the audience was now about 80% full. 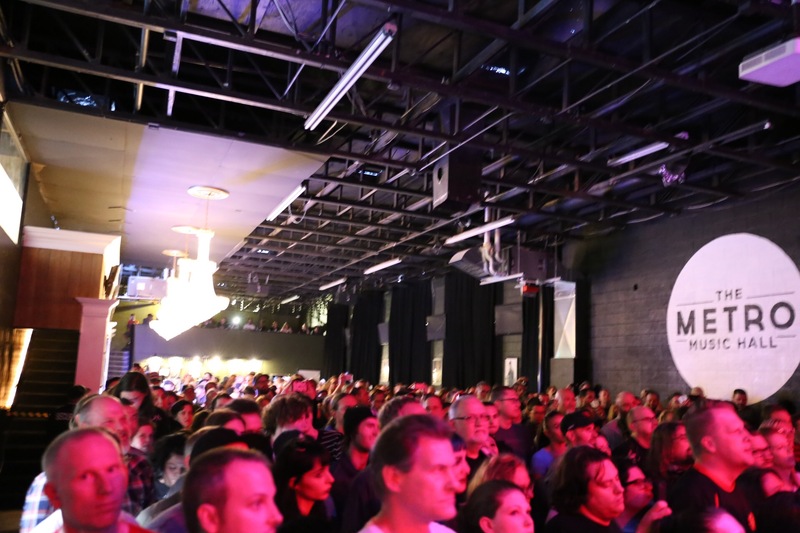 I feel like Utah crowds are generally encouraging to support bands. This was no exception. I think JD & The Straight Shot gained some fans here in Salt Lake City. 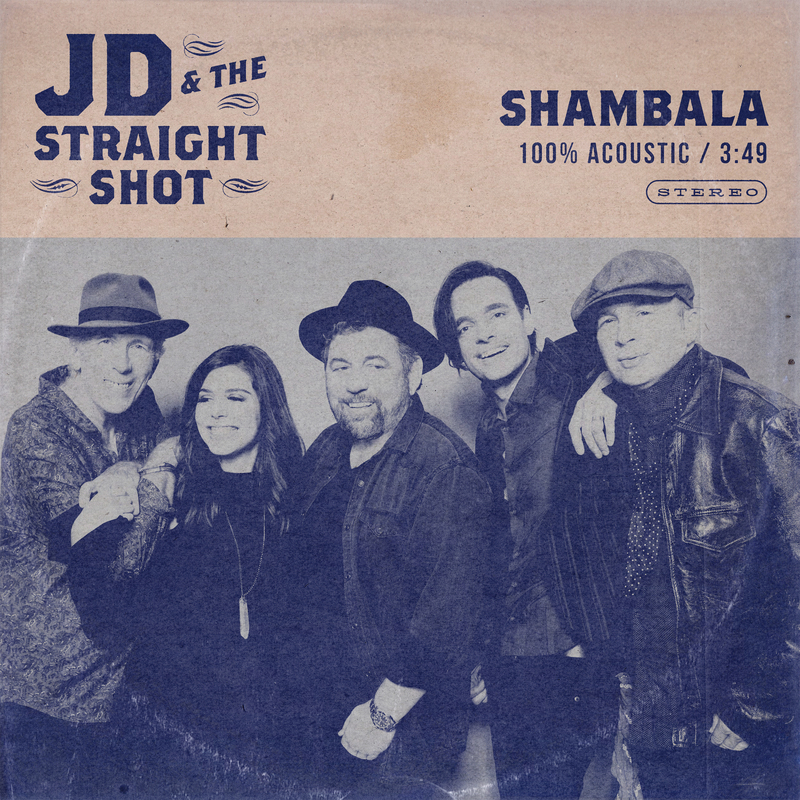 JD & The Straight Shot finished with a beautifully arranged cover of the Three Dog Night hit song “Shambala”. When they were done they walked off the stage to a rousing applause. I don’t know if this band has received a reception quite like this before. I sure hope so because they certainly work hard up there. They did their job as an opener. The crowd was warmed up for The Eagles, and JD & The Straight Shot most certainly gained some great exposure. Watch this video to learn more about JD & The Straight Shot’s newest album Good Luck and Good Night. Or click here to purchase the album. For as long as I can remember Poison has had a really strong fanbase here in Utah. On May 22, they bring their Nothin’ But a Good Time 2018 Tour to USANA Amphitheater with Cheap Trick and Pop Evil. 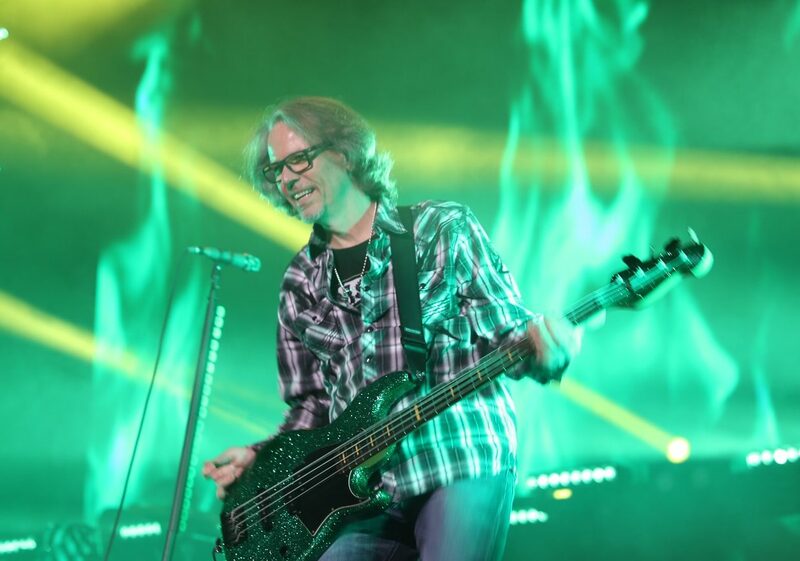 I had the opportunity to have a really entertaining and informative conversation with bassist Bobby Dall. Enjoy! 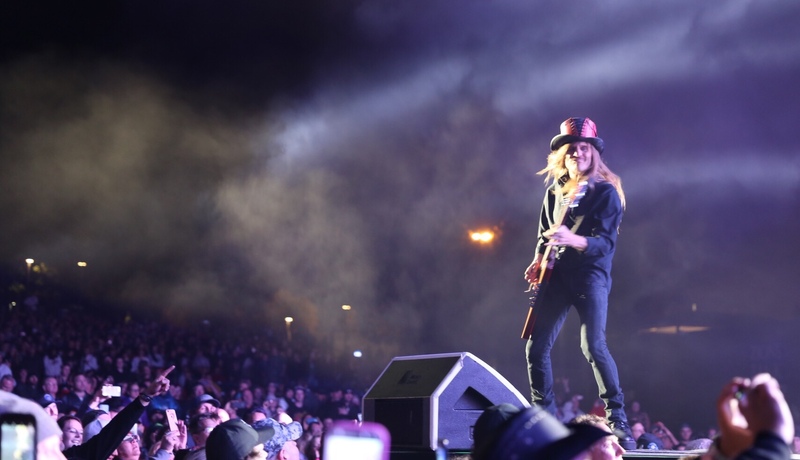 Utah Concert Review: Your last couple times playing here in Utah I believe you opened for Def Leppard at USANA Amphitheater. This time you’re headlining the show. Which means a longer setlist, your staging, etc. Was there a determining factor to tour as headliners again? Or did things just play out that way? Bobby Dall: It was definitely a mixture of things. We have headlined USANA before, several times. We’ve played there with Def Leppard, and I think Motley as well. This time around we’re headlining with Cheap Trick and Pop Evil. Lovely guys in Cheap Trick. The guys in Pop Evil, great music, I don’t know them personally, but soon we’ll get to know them very well. I don’t know, I guess it’s just the natural correlation of the next step in our career. We’ve spent several years not headlining, although we had a few headlining dates last year. But this year we’re headlining the whole tour. It’s always more fun when you have a little more control. You get to play longer and controlling the show and the environment. But you also have more responsibility as well. UCR: I’m sure one of the nice things about headlining out at USANA Amphitheater is you won’t have to perform while the sun is setting. It’s a great venue but I always feel bad with the openers at that venue because the sun is right in their eyes! BD: Yeah with the amphitheaters it’s always better to play when the sun goes down! (Laughing) But you know, in different situations you have to deal with it. UCR: So it seems like the thing to do these days is package a few bands together and send them out on tour? As a fan, I love it. But I have wondered what that was like for the bands. BD: Well since the beginning of Rock and Roll bands have been packaged up. In fact, in the 70’s, my first concert was Aerosmith, Cheap Trick, Ted Nugent, Rush, and about ten bands. It was the Florida Jam. That was the first time I saw Cheap Trick, who’s with us on this tour, and I fell in love with them. I think I was 15 or 16. You are right that bands are packaging up. But they always have. I believe in value for the fans. And the more bang for the buck is the best way to describe it. Having three bands on a package and going out and playing, give the fans more value for their money. And what I think is great about our tour this year is you’re getting a band from the 70’s, 80’s, and 90’s. So we really are covering three decades of fans. And our band itself, we’re always getting new fans each tour. UCR: So when you look at the bands of your era, they’ve become really fragmented. Sometimes there is only one original member of a band touring as the band. Or in the case of RATT, I think there are two versions of the band circling the globe. And while we don’t need to get into the history of it all, Poison has had their drama, but the original guys are still together. How have you done that? Do you just have to turn off the relationship aspect and make it about business? Or have you just figured out how to make it work? BD: Truly the secret is, we have a saying in the band “If you can get all four of us in the same room or on the stage we get a free pass.” It really does seem to work out that way. There are bands like you said that aren’t all the original members and there’s nothing wrong with that. It just is what it is. But I believe it’s important for us to be together. So hopefully the four members of this band will keep going for another ten, twenty, thirty years together. But as you get older it gets harder and harder. UCR: Now you’ve played thousands of shows over the years. But is there a song that no matter how many times you’ve played it, you’re still excited, and still enjoy playing it every time? BD: I love playing them all. But “Ride the Wind” is one of my favorites. Every night it’s always based on the audience reaction on any given evening. It isn’t about me, it’s about the fans. That’s the best way to answer it. But I do particularly love every time we play “Ride the Wind”. It never gets boring. None of the songs get boring playing them again and again. It’s great to have a such a deep catalog as we have. It’s one of the reasons we’ve been around so long. And I think it’s important to play those songs for the fans. But that’s just me. You can vary a little, but if you don’t give the fans the hits they won’t be happy. UCR: Are there certain cities in particular that you go to where you know without fail it’s going to be an awesome Poison show? BD: I love every city we play. And I won’t diss any city we pay. But you surprisingly get the most audience reaction from the cities that the least shows. We’ve never not been well received though. I’ve never had an experience where I haven’t been happy with the audience. BD: I do. It was in Pennsylvania, and it was in a fire hall near Mechanicsburg. It was the first show we played as a band. It was Poison, but we weren’t called that yet. We were called Paris. UCR: What was that experience like? UCR: Does that feeling still exist? Or have you performed so much that you’re just excited to get out there now? BD: The first show of every tour, my anxieties are a little high. But that’s typical and just the way I’m built. But once I hit the stage it all goes away. The second we’re in front of the audience I’m just part of this energy between the fans and the band. And if that initial anxiety goes away, that’s probably the time to stop doing this. UCR: Is there a band you make a point of seeing whenever they tour? BD: As far as a show that I’m not working on, I’ve seen the Rolling Stones about 7 or 8 times. Now I’ve seen other bands a lot more than that, but that’s usually a band we’re touring with. But as far as a band that I’ve gone to see, the Rolling Stones are my favorite band and the band who I’ve seen the most. UCR: Again, I know you’ve played a ton of shows, but is there a particular show, or maybe tour that you would say stood out as the best? BD: It’s so hard. Paul Stanley (of KISS) coming up and playing with us, all the bands we played with. I grew up on Aerosmith, I grew up on Cheap Trick, I grew up on Van Halen, so any interaction with any of those bands has always been exciting. I don’t have a particular favorite though. There’s just too many. UCR: Well let me ask you this in closing. Do you remember that feeling where you realized this was happening for you? UCR: Thank you so much, Bobby! See you at USANA! 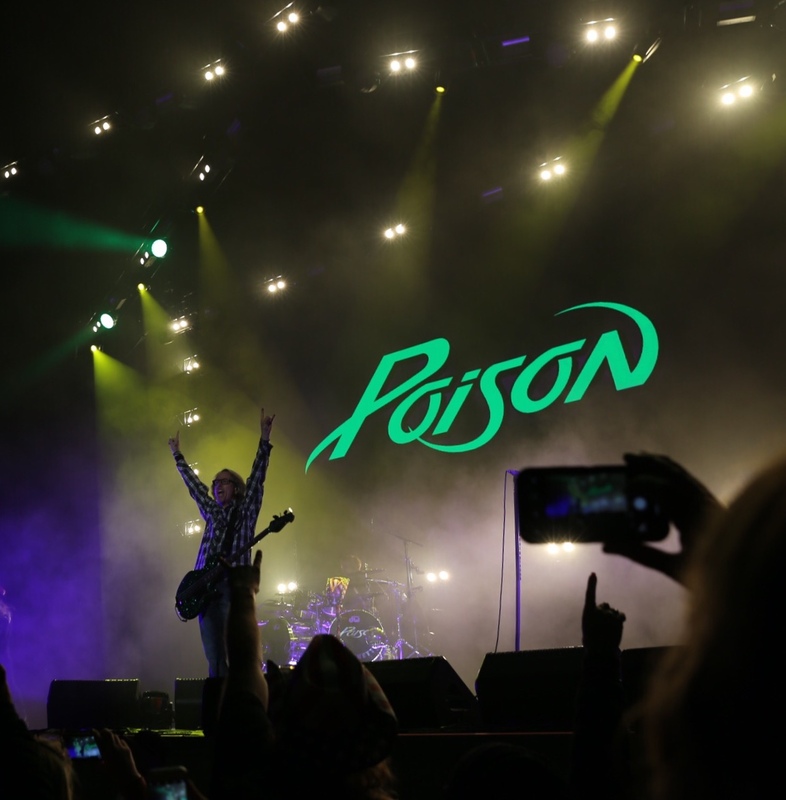 Poison will be at USANA Amphitheater on Tuesday, May 22. Click here to purchase tickets!